There are three things that cannot mix well with any kind of window treatment. These three things include humidity, moisture, and heat. 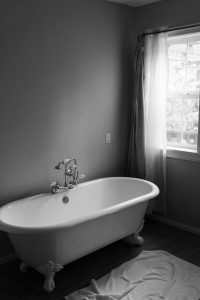 So, while selecting a window treatment for the bathroom, you have a very limited amount of options.Although these limited options can also help you in finding the functional as well as beautiful treatments as per your requirements for your bathroom windows. In other words, you will have to choose the window treatment for your bathroom tactically. So, what are the best blinds for a bathroom? Actually, the blinds and shades you may need should be heat and moisture resistant. What are the Best Blinds for a Bathroom? Though wood blinds are considered to be the best for every place, they may not be suitable for bathrooms. It is due to the high amount of humidity, moisture and heat in their environment which is not suitable for wood. However, you can still enjoy the looks of real wood in your bathroom by using blinds made from faux wood. These blinds will allow you to enjoy the luxury if real wood without any fear of getting damaged under the wrap of lots of humidity in the environment. Another benefit of using faux wood blinds in the bathrooms is that the growth of mold and mildew can be controlled easily. In this way, it can be a win-win situation for the homeowners to use faux wood blinds in their bathrooms. Honeycomb shades can also be a great option for bathrooms. These shades can provide enough amount of natural light inside your home after filtering it through its typical design. In this way, these shades will improve the energy efficiency of your home along with providing privacy to the homeowners to an exceptional level. They can easily bear the humidity and heat in the bathroom. They can serve you for a long time without any adverse effect on their performance. It is another suitable window treatment for bathrooms. Practically the advantage of vinyl shutters is similar to the blinds made from faux wood as it provides a good combination of beauty and performance. The lower half of these shutters can provide you complete privacy whereas their upper half provides your clarity and openness to see outside. So these shutters are perfect for bathrooms for their functional beauty. As stated above, wood blinds cannot be suitable for bathrooms, but there are several other types of shades and blinds which you cannot use in your bathrooms. Though natural Roman shades can be a beautiful option for any window, they cannot be used in bathrooms. Their natural fiber can promote the growth of mildew and mold by trapping moisture for its environment. You should also avoid aluminum blinds for your bathroom as exposure to moisture can rust it. Moreover, it is a costly option for budgetary people. You can’t deny the fact that the bathroom is one of the most used and important rooms of your home. As an important room, it always deserves the best. So, what are the best blinds for a bathroom? The information provided above can help you to choose what the best blinds are for a bathroom by choosing carefully. You can use vinyl shutters or honeycomb shutters, but be sure to avoid faux wood blinds and window treatments.